By Eric Langer, President and Managing Partner, BioPlan Associates, Inc. Preliminary results from our latest industry survey (11th Annual Report and Survey of Biopharmaceutical Manufacturers) indicate that for roughly four in 10 respondents the most recent batch failure occurred during the previous six months. That includes more than one in 10 saying it occurred within the prior month. On average, overall batch failures occurred once every 59.7 weeks. This compares to one failure every 53.3 weeks in 2013 and one every 51.1 weeks in 2009. So improvements are clearly being made at extending the industry’s average time between batch failures. Many firms have already implemented a range of initiatives, from QbD to process modeling. adopting newer cell lines and genetic engineering technologies. These are similar to the rates we found in last year’s study for what’s currently being implemented. That plateauing may suggest these initiatives are now broadly implemented, and fewer facilities are in the planning stages of implementation, compared with last year’s survey. So far this year, we are also seeing an uptick in implementation of initiatives such as design space/DOE (design of experiment) (58.9 percent, from 52.1 percent in 2013) and QbD (quality by design) (52.1 percent, from 43.7 percent in 2013). However, most of the other initiatives we measured have remained relatively steady compared to last year. As more facilities actually implement these initiatives, of course, fewer will be in the planning stages. And it seems likely that some who were planning to implement various initiatives last year are now following through. For example, in our latest survey, when we identified companies in the earlier planning stages, we found that 12.3 percent said they planned to implement QbD within the next 12 months, down from 19.7 percent last year. That was one of the larger swings, and for the most part there wasn’t a marked increase in planned implementation to go along with the rise in actual adoption. PAT (process analytical technology) did rise somewhat in terms of those entering the planning stage (vs. actual implementation stage) — some 21.9 percent of respondents to this year’s survey said they planned to adopt it in the next 12 months, up a few points from last year’s 18.3 percent. 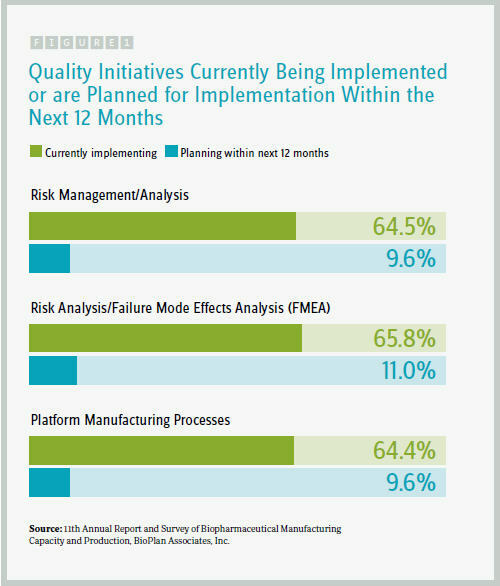 The data indicates that many firms have already implemented a range of initiatives, from QbD to process modeling. Those companies that have yet to implement will likely do so in the coming years. The data regarding quality initiatives being implemented in the next year shows that 10 of the 12 different types of quality-related analytical programs we identified are each expected to be implemented by around 10 to 25 percent of respondents, so one or more of these specific initiatives are likely to be implemented by the majority of facilities. Much of the motivation influencing companies to implement these programs involves keeping up (or catching up) with regulatory expectations and industry best practices. More developers are now filing applications developed using these quantitative quality-related programs, and the inclusion of this data in regulatory filings is ultimately going to be expected by regulators. The industry can expect other benefits from adopting these quality initiatives. These include manufacturing higher-quality products through better designed and optimized bioprocessing, likely along with considerable savings as problems are avoided and processes are further optimized for increased efficiency. The use of quantitative bioprocessing data management and processing for the purpose of more fully understanding and improving products is now an established part of the biopharmaceutical industry — and is expected by regulators. It’s likely that cost-saving programs such as PAT and QbD will be adopted by the majority of developers and manufacturers in coming years. Between current and planned adoption of the various initiatives we listed, the majority could see adoption rates of at least 60 percent by the end of this year, if respondents follow through with their expectations (admittedly, a big “if”). One challenge that must be addressed is integrating quality initiatives such as QbD into existing working quality and manufacturing systems. And ultimately, the success of initiatives such as PAT and QbD in biopharmaceuticals will depend on better sensors and analytical software. Computing power is now adequate. Better analytical data and analyses can allow biomanufacturers to make a strong business case for wider adoption of these tools to maximize yields, obtain purer product, and minimize quality defects. Survey Methodology: The BioPlan annual survey of biopharmaceutical manufacturers yields a composite view and trend analysis from more than 300 responsible individuals at biopharmaceutical manufacturers and CMOs in 29 countries. The survey included more than 150 direct suppliers of materials, services, and equipment to this industry. This year’s study covers such issues as new product needs, facility budget changes, current capacity, future capacity constraints, expansions, use of disposables, budgets in disposables, trends in downstream purification, quality management and control, hiring issues, and employment. The quantitative trend analysis provides details and comparisons of production by biotherapeutic developers and CMOs. It also evaluates trends over time and assesses differences in the world’s major markets in the U.S. and Europe.